4.67 out of 5 based on 46 user ratings. So far, Bridal reflections has been an excellent experience for me! Out of every salon they were the most helpful and offered the best advice. My saleswoman, Gloria, was so filled with information. She was well informed. She knew so many tips that I knew I had to use them. Shopping for my wedding gown was a bit of a nightmare just because I couldn’t find the 'one'. When I walked into Bridal Reflections The woman who helped me (Nawal) knew exactly what I was looking for. She pulled a Maggie Sottero dress that was everything I had envisioned and more. The dress was beautiful and not to mention the service was excellent. 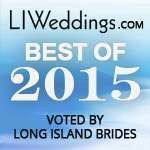 I would definitely recommend this bridal shop to all brides who are looking for an amazing bridal gown. You are treated so well from the moment you walk in the staff is so friendly and they all just truly want to help you. I had a great experience here and I love, love, love my dress!! 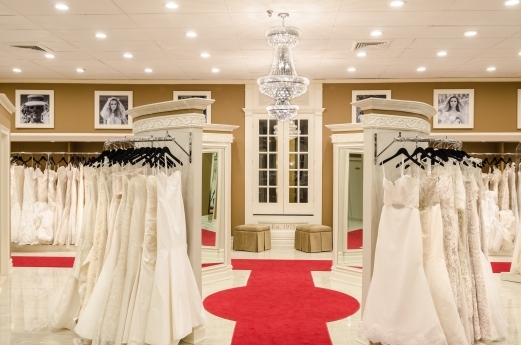 I drove all over Nassau County to save money on BM dresses and found that all of the Bridal Salons charge the same and they all have the same stock. For the $10 more that Bridal Reflections charges its worth it because the staff is very professional. I've been in a lot of weddings and recently tied the knot myself so I'm very in tune with the entire wedding planning process. This was my 5th time purchasing dresses at Bridal Reflections in Massapequa, there's never been a problem. 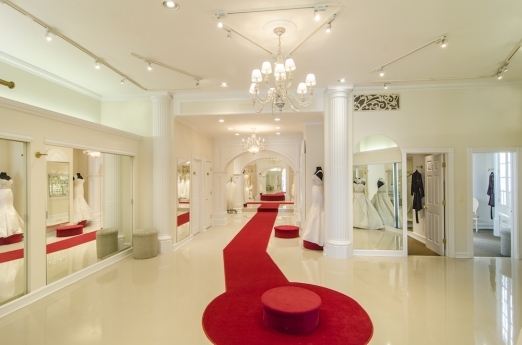 Bridal Reflections has assisted brides-to-be in finding that one perfect gown for over 40 years. Bridal Reflections has three convenient locations: Fifth Avenue in New York City, and in Carle Place/Westbury and Massapequa, Long Island. All three salons offer cutting edge designer wedding dresses and evening wear from the industry's fashion leaders. Their Long Island salons also carry a full selection of dresses for bridesmaids, junior bridesmaids, and flower girls. Brides have the added convenience of being able to purchase in one salon and then have fittings wherever it is most convenient. Our caring professional bridal consultants and world-class seamstresses are experts at making every bride look and feel as special as the moment. Looking for formal fashion? Visit our After-Five Salon! There, you'll find an incredible selection for every special occasion. 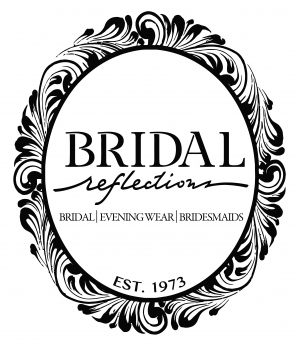 Bridal Reflections also carries a full line of gowns for the Mother of the Bride and Groom, as well as bridesmaid and flower girl dresses, custom made headpieces, veils, and a complete selection of eye- catching accessories for a one-of-a-kind look. Visit our website at www.bridalreflections.com where you can read our Bridal Blog, view a complete list of our upcoming designer appearances, trunk shows, and special events, and preview some of the many gowns from our collections! Like us on Facebook and follow us on Twitter to keep up with the latest news and announcements! We’re seeing brides wearing elaborate veils and investing in jewelry or hairpieces vs. tiaras. We are also seeing brides changing into simpler reception dresses, which means two “gowns” instead of one. What are some of the trends you are seeing in bridal gowns? We’re seeing brides wearing elaborate veils and investing in jewelry or hairpieces vs. tiaras. We are also seeing brides changing into simpler reception dresses, which means two “gowns” instead of one. And, brides are also incorporating broaches and sashes to add a splash of color or detail. What colors and styles are hot this season? We are seeing steel gray, teal and moss greens this upcoming fall/winter season. Classic summer colors consist of blues, pinks, yellows and reds, as the most popular choices. Stylistically for fall and spring, T-lengths are still as popular as floor length for bridesmaids. Bubble hems, halter and/or sweetheart necklines are being asked for as well. What recommendations would you give brides-to-be when they are gown shopping? Bring only those whom are instrumental in making a decision. I never recommend bringing all of your family and friends. Most brides find that too many opinions are confusing and stressful. Also wear what suits your personality and not what you are told you “should” wear. Don’t let the trends dictate what you love. Remember that you have to account for your height, body type and coloring. If you are a simple and understated bride, your wedding should reflect that. Be adventurous and try on what the consultant recommends, most brides are usually pleasantly surprised. How have the trends changed over the years? Season after season trends change. Bridal tends however tend to traditionally change more slowly. You see what was “hot” on a runway for a few seasons in bridal. In the years I have been buying gowns for Bridal Reflections, it’s the necklines, waistlines and skirt fullness that are most commonly changing. Fabrics and laces are pretty consistent. What types of gowns are you seeing for daytime events? How about evening events? Gowns for evening weddings usually tend to be a bit more elaborate. More bling, beading and longer trains. Gowns for daytime wedding are often more toned down, including use of softer fabrics, simpler cuts and styles, and fewer embellishments. However, there are really NO RULES. Some brides with a very formal wedding on a Saturday night opt for simple silk gowns with sweep trains and no beading, while some afternoon and morning brides want all the fancy bling. Should mom have a say in what the bride is going to wear? Can grooms get involved if they want to? Moms should be honest and supportive, but they should not choose the gown for the bride. In fact, I would suggest that moms remember that this is the one opportunity for the bride to really express herself. As a traditionalist I don’t believe that the groom should get involved with the choosing of the bride’s dress. He should be the most surprised person, other than the guests, when he first sees his bride and her wedding day attire. What advice can you give moms and their girls who are looking for that perfect gown? I suggest being respectful of the bride’s sense of style. Remember, it’s the bride’s choice and she’s the one that will be looking at her pictures forever. It’s HER day. No matter how helpful a mom is trying be, it’s important to give advice without taking away from the fun and excitement of the bonding, shopping, and planning experience. How many gowns should a bride-to-be try on before she makes her final decision? Actually, that all depends. Some brides just try on one and “know”, others need to try on many and then sleep on it. Everyone is different. I suggest trying a few bodylines to see what style best suits your body type. Once that’s determined, 5-8 gowns per visit is a good average. Find a consultant you like and trust…they are usually very good at narrowing down your choices based on budget, fabric, personality, and bodyline. Can moms from both sides accompany the bride when she picks out her gown? Have you seen much of this? Sometimes brides bring both moms. Most of the time however brides bring “their” mom and the maid of honor. If you want to include your future mother-in-law in “some” way, consider bringing her when you pick out your headpiece or to one of the other planning or shopping events. Trying to include your future husbands mom is not only a nice gesture, but very thoughtful, especially if she has sons and no daughters. I know color is making a splash in wedding gowns. What colors, if any are “no-nos” when it comes to daytime weddings, evening weddings and/or weddings in general. We are seeing colors primarily in sashes, embroideries and in shoes. Brides are wearing pink, blue, and black shoes. And, there are really no colors that are “no-nos”. Some brides may be superstitious and avoid black, or some other color, based on their heritage and their culture…but outside of that, the sky’s the limit. Colors are especially popular in the summer, with many brides incorporating them in accents and for their bridal party. How soon should the soon-to-be-Mrs. start looking for her gown? How far in advance should she have a gown picked out? Dresses take 6-10 months to be made and then time has to be allowed to make the necessary alterations and choose the appropriate accessories. Once a bride finds “The One” I recommend ordering it so that if any delivery delays occur, it won’t be a problem. This will also insure that the “dream dress” doesn’t get discontinued. Tell us about alterations and how that works. Brides have about 3-4 fittings including the final/pickup appointment. The seamstress will make all alterations, custom changes, and bustle the gown. Throughout these appointments, brides must have their shoes and appropriate undergarments at ALL fittings. We cap the price of our alterations so the brides know what the absolute maximum charges will be at the time of purchase. Tell us about accessories and what she should look for and strive for? And, tell us about the different accessories for summer brides and winter bride as well as daytime brides and evening brides. Bridal accessories are not typically seasonal or dependent on the time of day or night. In fact, accessories should enhance the bride’s overall look and not overpower her or her gown. Some winter brides may incorporate a hairpiece with crystals and feathers, while summer brides may opt for a flower or Russian net veil. Most importantly, the accessories should add the “finishing touch”, and make the bride feel like “a bride”. Are many brides opting for two gowns; one for the ceremony and one for the reception and how should they approach making each decision? Tell us about some of your best sellers. 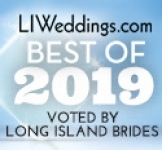 Some best sellers for us here at Bridal Reflections are Bridal Lines like Ines DiSanto, James Clifford, Marisa St. Pucchi, and Romona Keveza. We also sell bridesmaids collections like Lazaro, Jim Hjlem, Bari Jay Watters and Watters, and Bill Levkoff. Mother’s collections include StephenYearick, Jovani and Montage, among the most popular selections. We do very well with lace and strapless necklines, as well as with corset backs and full skirts with pick-ups. Can dresses be ordered in custom designs and/or sizes? Yes, dresses can be customized and can be modified. Some designers are more flexible than others. Remember, we can always do custom work in the salon to accommodate a maternity situation or the addition of a shrug or jacket, etc. All of our suppliers make a very varied array of sizes and lengths to accommodate most brides and bridesmaids. How long do specialty items or orders take? Depending on the designer, most specialty items (gowns) can take 6-12 months to come in. Accessories, headpieces and veils usually take about 3 months or less. Bridesmaid dresses and items usually arrive within 3-4 months. Tell us about matching mom’s gown to the bride’s gown. Most mothers’ styles do not match the bridal gown but do, in some fashion compliment it. On other occasions mom picks something completely unique, different and distinctive. Also, sometimes brides will request that EVERYONE have a small jacket or shawl for the ceremony. With so many beautiful gowns to choose from, how will mom know when she’s found “the one”? It’s the same for mom as it is for the bride. Moms should try on bodylines that are flattering to their body style and personality. Most mothers’ gowns are available in many colors and can be ordered with jackets and/or shawls if needed. What advice would you give brides when helping mom or mother-in-law pick out her gown? I would say make sure you have moms discuss color BEFORE they begin their search, this way there is no arguing about who picked what and when. Some brides are open to any color and other brides have a specific theme. Traditionally, the mother of the bride has first choice. Should moms take into consideration what dads will be wearing when picking out their gown? Father’s have it the easiest. Mothers should select the style and color of the gowns and then the fathers should coordinate accordingly. Sometimes the dads wear matching ties or vest. Bridal Reflections will provide Mothers with the proper swatch of material so the dads can get the best match.